Bhutan is a small land-locked country in South Asia sandwiched between India and China. Bhutan’s landlocked borders were established around the 7th century and the country has managed to hold its own since then. The Kingdom of Bhutan has a total land area of just under 15,000 square miles and a population of around 650,000. 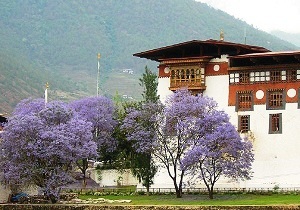 Bhutan has a varied climate with the tropical Southern plains, cool winters and hot summers in the valley, and extreme winters and cool summers in the northern Himalayan ranges. It is however considered as one of the most isolated areas of the world – it took until 1962 for Bhutan to release its first postage stamps for international use. Even today, Bhutan has just one airport – the airport in Paro which is considered one of the most challenging airports in the world due to its location in a steep valley. Bhutan's economy is based on agriculture, forestry, tourism, hydroelectric power exports to India, and the sale of postage stamps. More than half the country’s population is engaged in sustenance farming. Bhutan is using a balanced approach toward modernization with a focus on Gross National Happiness. In 1999, it became one of the last countries to introduce television with the lifting of a ban on television and internet. The per-capital GDP (ppp) stands at around $5000 with the economy growing at a very rapid pace in the last few years. For most visitors, Bhutan is a spiritual journey than anything else. Tourists experience Bhutan as part of a travel package since the government regulates tourism. Bhutan can be described as an expensive getaway at around $200 per person per diem on the average. Drukgyel Dzong, Rinpung Dzong, Bumthang Dzongkhag, Phobjika Valley are but a few of its attractions. Bhutanese cuisine is very spicy as chilly is used extensively. Meat is consumed almost as the rate of vegetables. Lonely Planet Bhutan 978-1740595292 $17 Perfect mix of history, culture, itineraries, architecture along with detailed region-wise coverage. Bhutan Travel Map 978-1553411390 $13 1:380,000 scale. Legend includes hotels, camping sites, Dzongs, and other points of interest. Radio Shangri-La: What I learned in Bhutan, the Happiest Kingdom on Earth 978-0307453020 $14 A good mix of personal experience and research in a book that is both educational and inspirational. A set (Scott #8 and #9) of two stamps released on October 10, 1962 to mark the World Refugee Year. The issue is significant in that UN declared 1959-60 as the World Refugee Year and the issue came two years later. This is because Bhutan hadn’t started issuing stamps in 1959-60 time frame. The set catalogs for under $10 MNH or used. 5ch surcharges on these 1nu and 2nu stamp respectively issued in 1965 are rare and valuable. Each of those (Scott #68 and #69) catalog for around $35 each for MNH or used. A set (Scott #15 to #23) of nine stamps released on April 16, 1964 in the “Bhutanese Dancers” design. The colorful set is also fairly inexpensive at less than $5 MNH or used. Surcharges on part of this set were issued in 1965 and they are more valuable. Each of those (Scott #70, 71, 74, 75) catalog for around $12 MNH or used. A set (Scott #31 to #33) released on November 22, 1964 in memory of those who served in the service of their country. The design shows “Flags of the world at half-mast” in gray, silver, and gold backgrounds respectively. The stamps are valued at around $5 MNH or used. Imperf versions and a souvenir sheet also exist which are valued somewhat higher. Although the theme is global, 1964 was an especially tumultuous period in the country’s history – in April 1964, Jigme Palden Dorji, the prime minister was assassinated by an army corporal. An assassination attempt on the third Druk Gyalpo (Dragon King), Jigme Dorji Wangchuk, followed in 1965. The underlying reasons for the problems are unclear – distrust between the Wangchuk and Dorji families, opposition to India’s interference in Bhutan, and power struggle between the Dorji and Yangki (family of Druk Gyalpo’s Tibetan mistress) families are factors. A set (Scott #47 to #52) released on April 25, 1965 to mark New York World’s Fair. The design is unique as it attempts to show architecture from the rest of the world alongside Bhutan’s historical monuments. The themes show Bhutan’s historical monuments in the foreground with a lightly shaded single-color image in the background. The designs were skyscraper and pagoda, Pieta by Michelangelo and statue of Khmer Buddha, skyline of NYC and Bhutanese Village, and Georoge Washington Bridge, NY and foot bridge, Bhutan. The set catalogs for less than $3 MNH or used. Souvenir Sheets and Imperf versions which fetch double that also exist. A set of twelve stamps (Scott #91-91k) released in the space theme released on October 30, 1967. These stamps are the first 3-D stamps ever released. The technology used a simulated 3-D effect using a plastic overlay. The designs were Astronaut walking in space, Orbiter and Lunar Module docked, Lunar Module, and Astronauts. The set catalogs for around $30 MNH or used. The next ten years saw many such sets and most of them are valued in the $10 to $30 range. The most valued among them is the Birds set (Scott #104 to #104g) of eight stamps released on August 5th 1969. The beautiful set catalogs for around $50 MNH or used. The designs sho owl, red birds, hawk, penguin, macaws, bird of paradise, duck, and pheasant. A long set (Scott #252 to #269) of twenty six stamps released in 1978 in varied themes that were surcharges on previous issues from the 1967-76 time period. The set is valuable at around $120 for MNH or used. A stamp (Scott #1135) issued on December 17, 1996 celebrating the Penny Black, the world’s first postage stamp. The stunning design features a 22-karat gold lithographed and embossed Penny Black in a dark-brown background. The stamp catalogs for around $10 MNH or used. A beautiful sheet of six stamps (Scott #1324 a-f) released on June 1, 2000 celebrating Bhutan’s Dzongs. Dzongs are massive but beautiful structures built starting around the 16th century under the direction of a high lama without the use of any architectural plans – instead, spiritual inspiration was the guiding light! The structures were built for religious or defense purposes. The set is very inexpensive at around $2 – nevertheless, it is an important issue that showcases architecture unique to Buddhist kingdoms of the Himalayas. The first-ever CD-ROM stamp released in May 2008 to mark the hundredth anniversary of its hereditary monarchy and the coronation of its fifth King, His Majesty Jigme Khesar Namgyel Wangchuk. The CD features an 8-minute documentary about the country’s five monarchs along with a web portal. The CD-ROM stamp catalog for around $10. This release was followed by a few more CD-ROM stamps. They are also valued around the same range. Coins $3 and up Common UNCs start around $3. Large Silver Proofs from the 1990s start around $30. 1970s and prior UNC complete year sets start around $100. Ngultrum Gold Proofs from the 1990s start into the 100s. Paper Money $1 and up Common Ngultrum Banknotes in UNC start around $1. Z Replacements and Bundles start around $20. Scarce Bundles, First Issue UNCs etc start into the 100s. Buddhist art, textiles, and antiques are the sought after items. Items tend to be on the expensive side. With antiques exercise caution as it is illegal to take out of the country anything more than hundred years old. Ethnic Clothing $200 and up Handwoven Kira Kushutara sheets and blankets. Antiques $30 and up Silk woven tapestry’s and small bronze curios start around $30 and the more exotic ones made of silver are valued well into the 100s. Hand Woven Pure Silk authentic Kira woman dress (national women’s dress) can fetch into the 1000s. Art $15 and up Buddhism, King, and War themed 19th century prints start around $15 with framed bigger prints priced well into the 100s.